The Writing Workshop offers an alternative route First-Year Writing Seminar, WRIT 1370 (Fall) and WRIT 1380 (Spring) titled "Elements of Academic Writing." 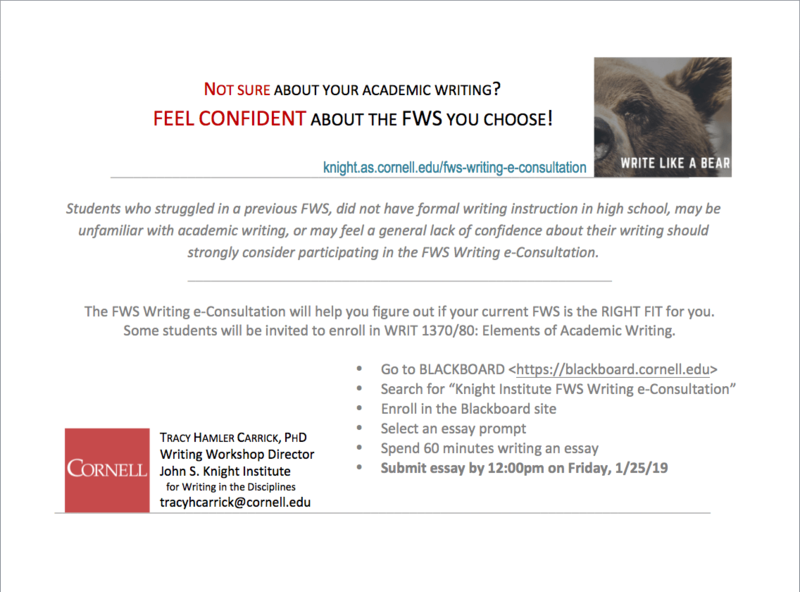 This course is designed for students who did not have formal writing instruction in high school, are unfamiliar with academic writing, have serious difficulty with writing assignments, or feel a general lack of confidence about their writing. Some sections of these First-Year Writing Seminars are designed for international students and multilingual writers and include special instruction on developing fluency in academic English and navigating new cultures of writing. Graded S/U only, students receiving a grade of S are granted credit toward their college writing requirements. The Writing 1370/80 classroom is a dynamic workspace where students assemble the scholarly tools necessary to explore complex, interdisciplinary questions. Because Writing 1370/80 is designed as a workshop, students develop the analytic and argumentative skills fundamental to interdisciplinary reading, research, and writing by collaborating with peers to pose questions, examine ideas, and share drafts. With small class sizes and two 50-minute class sessions and a student/teacher conference each week, Writing 1370/80 is an alternative route FWS that provides an individualized setting for students to learn flexible and sustainable strategies for studying the essential elements of academic writing and for producing clear, precise academic prose that can address a variety of audiences and meet diverse rhetorical aims.